In the midst of the student struggle, let’s pause to remember the Black Panther Party, which would be celebrating its 50th Anniversary since its founding, had it not been viciously and illegally crushed by the United States (US) authorities. We have much to learn from the short history of the Black Panthers. Say Black Panthers and immediately it evokes images of afros, leather jackets and closed fisted salutes. But they were much more than that. The Black Panther Party, formed in the US in October 1966; was the largest Black revolutionary organisation in US. During the time, black people faced racism, threats from the Ku Klux Klan (KKK), police brutality and high rates of poverty. The Panthers were formed in response to this crisis. The Panthers like the South African student activists of 2016, were influenced and inspired by the writings of Frantz Fanon and later on by Steve Biko. At its strongest, the party had grown to 5000 full-time party workers. The Party’s agenda was to radically transform society across race, economic, gender, social and political lines. The Panthers had their own Freedom Charter, the “10-Point Program” – a set of demands that is relatable, accessible and concrete. The program was an expression of the needs and desires of the people. 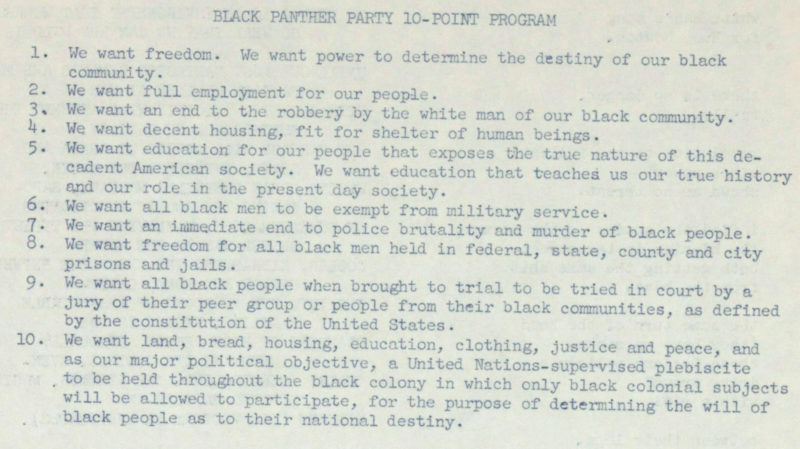 The 10-Point Program included demands such as: freedom and the right to self determination for black people. The program was the heart of the organisation. It embodied what they wanted, and what they believed in. 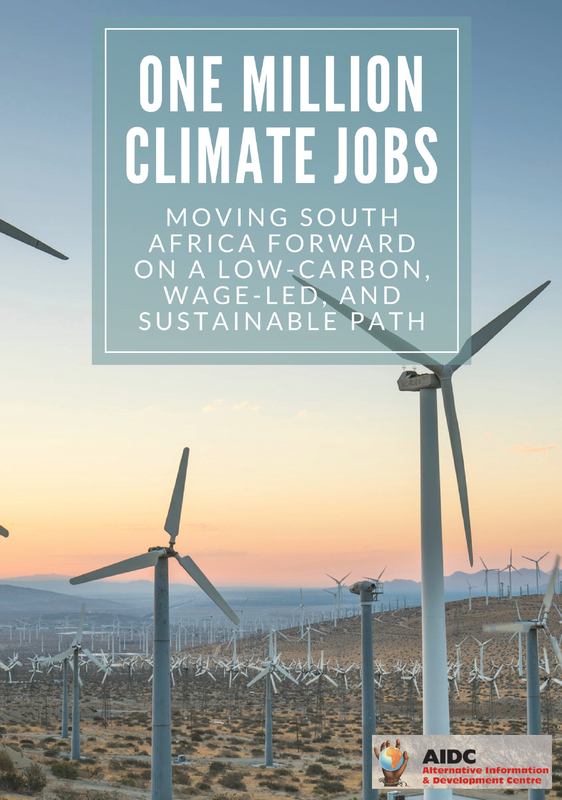 They made sure that the program was easy to understand and that the demands resonated with the people in their communities. Besides resonating with the working class and the poor – these demands challenged the fundamental principles of capitalism. In South Africa today we can easily be confused by race essentialist politics that characterises everything in crude black and white terms. Even though the Panthers advocated for the self-determination and freedom of black people, they were not a racist organisation. On the contrary, they were scathing towards racists; both white and black. The Black Panthers believed in black nationalism but was aware of its limitations as an emancipatory political practice and ideology. For the Panthers it was important to understand racism historically and why it was constructed. They felt race and ethnic differences was created and used as a means for the power structure to exploit the masses of workers. They argued that black nationalists – those who speak only in race terms, are the servile followers and proponents of the ruling class, in order to serve their own interests. Colour was not part of their understanding of the ruling class. For the Black Panthers it is not a race struggle; instead it is fundamentally a class struggle – between the oppressed majority and the minority ruling elite. For the Panthers, working class people of all races must unite against the exploitative oppressive ruling class in order to overcome this major struggle. 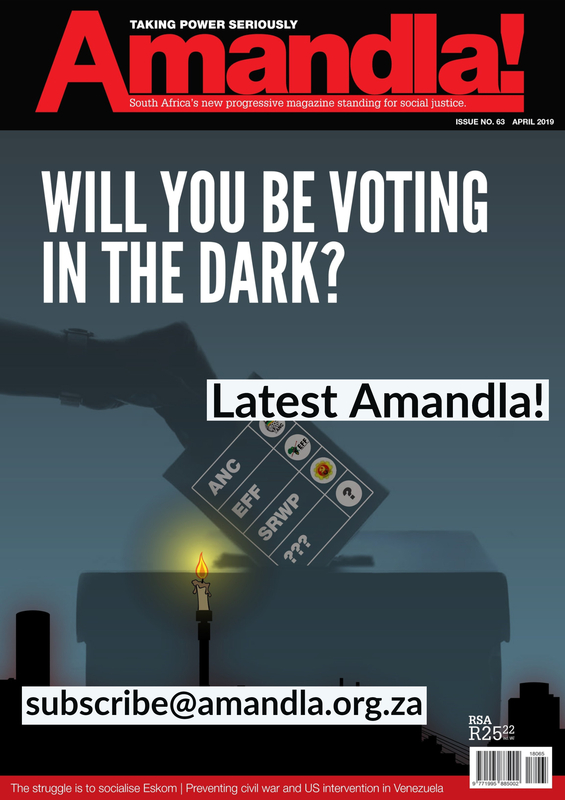 The Party was so clear on its position on racism that it even cautioned against the notion of buying “black business”. The Party argued that if the black business is charging the same price or higher than exploitative white business then buying black is not a radical practice at all. In this instance the black business is just as exploitative and is not assisting in the liberation of black people. In organising and mobilising the Panthers were well aware that the legal system reflected the interests of the ruling class, and was meant to ensure the continuation of the rule over the majority by the few. Similarly, in South Africa we see how the ruling elite uses the state apparatus (judicial system and the police for example) to neutralise protest action. We saw it in Marikana in 2012 and we see the militarisation and policing of South African universities in 2015/16. The Panthers experienced similar repression. The organisation was such a big threat to the system, that it had to be responded to and squashed immediately, whatever it took. The state used the police, the media, the FBI – secret intelligence – anything they could, to eradicate the threat posed by the Panthers. Despite this, the Panthers made sure that they challenged the system within the legal framework. The Panthers used the law to ensure that their own civil rights – however limited, were protected. Besides arming themselves. The Panthers – in an attempt to stop police brutality in black communities, started watching the police; policing the police. US police brutality, which is in the news nowadays, was considerably worse in the 1960s. This helped the Panthers to gain the communities trust which enabled the Party to attract new members and grow exponentially. On the issue of violence: the Panthers were a militant organisation. Importantly though the Panthers were not hungry for violence – they hated violence. But, they believed in defending themselves – by any means necessary, including the use of arms. However, the Party cautioned against a glorification of violence. Especially violence that substitutes for organising and implementing revolutionary programs. Significantly, amongst other things, the new student movement in South Africa challenged the issue of patriarchy in society. The Panthers posited that there is a mutual dependence between racist-patriarchy and the reproduction of capitalism. For the Panthers, we cannot realise an anti-patriarchal and anti-racist society in a capitalist system. 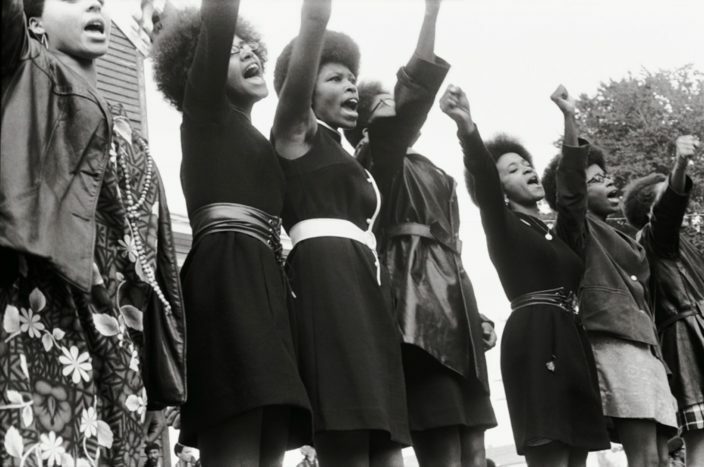 Some of the most committed and passionate activists of the Black Panthers were women. Women, Angela Davis said “are often at the heart of anti-racist and progressive activisms”. Alas, even though the Party consisted of approximately 70% females, who were some of the most committed and passionate activists, the leadership was dominated by males. This points to one of the big contradictions within the Party. The Panthers fought for a non-sexist society but were unable to address the issue of patriarchy within the organisation. But through their work they were able to create an enabling environment for black feminist consciousness. Regardless of the fact that the Panthers were not able to fulfill their overall objective; I think that it fulfilled its revolutionary duty. If Biko offered up, as Angela Davis said in 17th Steve Biko Memorial Lecture, “a politics of blackness – releasing being black from the constraints of inferiority, telling us that black is beautiful – be proud of your blackness”, the Panthers made black people realise that they are beautiful. A group of radicals, dedicated and committed to the ideals and ethos of the organisation. An organisation whose existence was centered around the economic, political, social emancipation of the oppressed people. The Panthers were a force that directly challenged the racist capitalist system. The structures feared them because they attacked the roots of the system, en masse. Remembering what the Panthers stood for and what they believed in can help us to clarify, sometimes, confusing positions on some of these critical questions in society. The Panthers can act as a compass, guiding us on what it means to be a black radical who challenges the powerful capitalist system to its core. Students are often the catalyst for radical change. Biko organised students. He led his contemporaries to ask questions. The student movement of today is greatly influenced by Biko. In the spirit of Biko and questioning, where’s our Black Panther Party today? Is it possible that because the Black Panther Party was so critical of race essentialism that the philosophy of the Black Panthers was in fact, thrown to the side? In order for this struggle to have meaning, the oppressed must not in seeking to regain their humanity, become in turn oppressors of the oppressors, but rather restorers of the humanity of both. This, then, is the great humanistic and historical task of the oppressed: to liberate themselves and their oppressors as well. Thank you for your comment, we would be interested in knowing where you have quoted this article or for what purpose? Please share…. 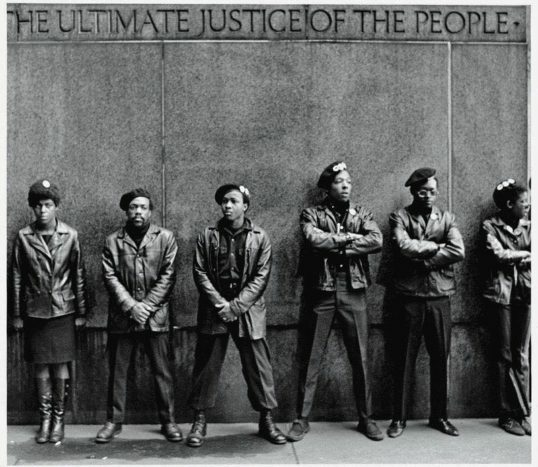 1 Pings/Trackbacks for "Power to the People: Remember the Black Panthers – 50th Anniversary"